Dalziel Racing :: A couple of smart debutants unearthed on Derby Weekend! While 87,000 enjoyed the treat that was VRC Derby Day at Flemington, Dalziel Racing have been busy travelling from Horsham to Kilmore, picking up a handy double with two promising debutants on the biggest weekend of racing for the year. The weekend got off to a strong start with the talented 3yo HOAGLAND impressing with a narrow but strong win over 1200m at Horsham. After showing promising signs as a younger horse the 3yo son of Poet's Voice had been given plenty of time to mature and he duly rewarded his owners with Friday's commanding debut win. The official margin was only a long neck, however jockey Linda Meech believed Hoagland had plenty more to give and was a horse capable of working through the grades with further race experience. 'We have always had a bit of an opinion of this bloke, he's very workman like and he'll be much better in the autumn with a bit more time to strengthen and mature'. Said Wylie Dalziel after the win. 'He's been beautifully managed by Ciaron Maher and now Aaron Purcell and it was another 10 out of 10 ride from Linda. We'll see how he comes through this and make a decision as to where to from here'. 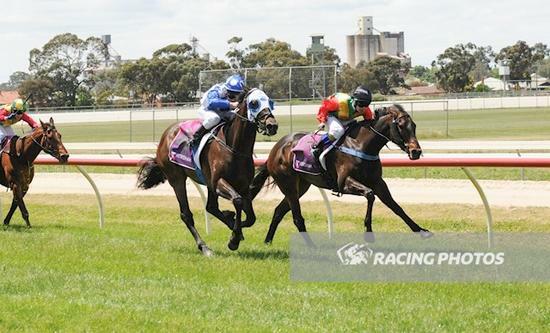 The other impressive debutant from Dalziel Racing was the Ocean Park filly OCEAN DEEP at Kilmore on Sunday. The 2016 NZ Premier Yearling Sale purchase was on debut over 1200m, with Lindsay Park putting the polish on the filly and Linda Meech on board for yet another Dalziel Racing runner. After jumping well Linda put OCEAN DEEP in to a beautiful position in running and after taking a few strides to balance up as they straightened for home the daughter of Ocean Park let down strongly to win by half a length on the line in what was a commanding debut performance. 'She comes from a really stout family and I think she is going to be a beautiful autumn filly. Who knows how far she will get, however today was a very impressive debut and I can't wait to get her further out in trip'. Said a thrilled Wylie Dalziel after the win. 'She's in the right hands at Lindsay Park and David and the team have done a wonderful job with her. She was beautifully placed and ridden today. Like most of these staying types you need to be patient and we have a great group of owners in her who I think are in for a lot of fun'. OCEAN DEEP DEBUT WIN - bet365 Park Kilmore Race 2 - 5.11.17 from Dalziel Racing on Vimeo.